Of Wind and Waves: The Life of Woody Brown, an award-winning hour-long documentary on a 95-year-old legend in the worlds of surfing, sailing and soaring, will receive its Hawaii broadcast premiere on PBS Hawaii on Tuesday, December 11, 2007 at 8 p.m. Woody Brown has not only lived a life full of remarkable adventure and accomplishment – including inventing the modern catamaran, setting world gliding records, and surfing Hawai’i’s 25-foot surf in the early 1940s – but he has also done so with a kind of selflessness and generosity that have made him a role model for three generations of Hawaiians and virtually everyone who has met him. 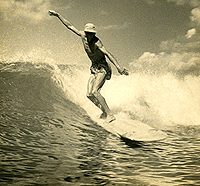 Two-time Emmy Award-winning filmmaker, David L. Brown (Surfing for Life), produced, directed and photographed the film. 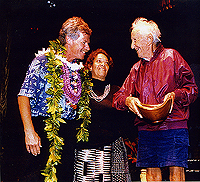 Photo: David L. Brown, Anona Napoleon and Woody Brown at the Hawaii International Film Festival awards ceremony, where "Surfing for Life" received the "Golden Maile Award" for Best Documentary. Filmmaker David Brown states, “Woody is like a modern Thoreau on a surfboard, living in harmony with the world around him, alive to the possibilities of each new day, and following his own singular vision of how to be in the world.” The documentary captures his unique blend of enthusiasm, wisdom, humor and spirituality that have made him a truly inspirational figure. Born to great wealth in New York City, Woody ran away from the life of privilege to become a protégé of Lindbergh at age 16. The film portrays his journey to become a world record glider pilot, surfing pioneer and inventor. It also depicts the tragic death of Woody’s first wife in childbirth which led to the painful decision to let relatives adopt his two children. Of Wind and Waves provides a valuable cross-cultural portrait of the land, people and culture of Hawai’i over the six and a half decade span of Woody’s life there. While the explosive economic growth of the islands has unquestionably undermined and obscured many Hawaiian traditions, Woody Brown’s story shows that the spirit of aloha remains very much alive. Of Wind and Waves won the “Inspiration Award” at Mountainfilm in Telluride in May of 2006 and “Best Surfing Film” at the Byron Bay Film Festival in Australia. The 35-minute version won the “Audience Award for Best Short” at the 2004 Maui Film Festival. 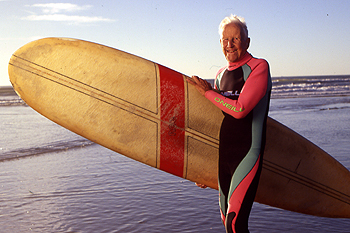 Santa Barbara Independent: Of Wind and Waves presents the truly inspirational tale of the 94-years-young surfing, gliding and sailing legend, Woody Brown. Full of timeless advice and captivating stories, this bio-documentary from San Francisco’s David L. Brown tells the story of one of surfing’s most overlooked legends. There are true gems of wisdom hidden in this movie that are rewarding for all. Click to see Press Photos. Producer/ Director/ Writer David L. Brown is two-time Emmy Award-winning San Francisco documentary filmmaker who -- over a 35-year career -- has produced, written and directed over 80 productions and ten broadcast documentaries on social, nuclear, health, environmental, aging, peace and technology issues. His current projects include a feature length documentary portrait of drummer Barbara Borden (www.kobmovie.com). Amazing: The Rebuilding of the Macarthur Maze, a half hour documentary on the fiery collapse and speedy rebuilding of Oakland’s MacArthur Maze. It will receive a national PBS broadcast in March, 2008. The Bridge So Far- A Suspense Story, an hour documentary on the wild and troubled history on the new east span of the New East Span of the S.F. Oakland Bridge. It received two Northern California Emmy Awards, including Best Documentary. It will receive a national PBS broadcast in March, 2008. Digital Democracy Comes of Age, a 30-minute documentary on progressive blogging produced and aired by LinkTV. Free Zone: Democracy Meets the Nuclear Threat, a 58-minute documentary on the international nuclear free zone movement which received 13 awards and was broadcast on public television and in several countries. Produced, written and directed by David L. Brown; Videography by Steven Baigel, David L. Brown, Vicente Franco and Judy Irving; Edited by David L. Brown, Steven Baigel, and Gina Librecht; Sound recording by Jaime Kibben, Randy Mills; Narration by Steve Pezman; Music by Tom Disher, Sons of Hawai'i, Gabby Pahinui, Genoa Keawe, Ray Kane, Keola Beamer.